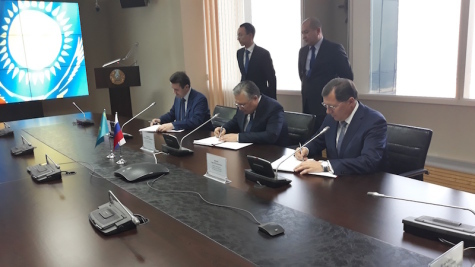 ASTANA, Kazakhstan --- A contract was signed today in Astana to organize the large-scale assembly of Mi-8AMT / Mi-171 helicopters between NK Kazakhstan Engineering of the Ministry of Defense and Aerospace Industry of the Republic of Kazakhstan, Aviation Repair Plant No. 405 and the Russian Helicopters company of Russian State Corporation Rostec. This document was concluded in accordance with the previous agreement between the Presidents of the Republic of Kazakhstan, N. Nazarbayev, and of the Russian Federation, Putin V. V.
The assembly of helicopters and their adaptation to the requirements of the customer will be carried out at the production sites of JSC Aircraft Repair Plant No. 405. This company has the greatest competence in ensuring the safe operation of helicopters of this type in Kazakhstan. Aircraft Repair Plant 405 JSC is certified by Kazakhstani and international bodies for the repair, modernization and maintenance of Mi-8/17/171 type helicopters. It should be noted that in Kazakhstan for the first time the technology of assembling heavy helicopters is being introduced and the assembly production is organized without requiring budgetary investments. The launch of the assembly production of helicopters will ensure a significant development of the domestic defense industry complex, the civilian helicopter industry, the training base, etc. Today, the main customers of the Mi-8AMT / Mi-171 helicopters in the Republic are a number of government agencies and commercial airlines. Reference: The Mi-8AMT / Mi-171 helicopter was developed by the Moscow Helicopter Plant Mil, and can be used for the transport of passengers, of goods weighing up to 4,000 kg in the cabin and on the external hook, as well as carrying out search and rescue and fire-fighting missions. Currently, in the countries of Central and Southeast Asia, the Middle East, Africa, Europe, Latin America and the CIS, more than 1,000 helicopters of this type are operated in various versions.